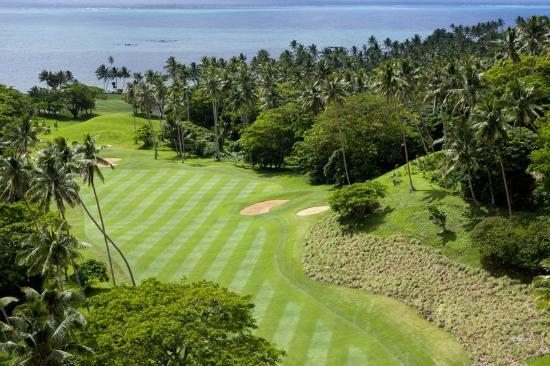 Top Fiji Golf Resorts - Fancy a golfing holiday? Ever dreamt of golfing in paradise overlooking the Pacific Ocean? 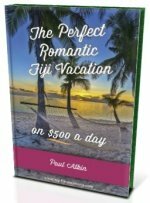 Then find out about these Fiji golf resorts where it couldn't get anymore laid back! This first category are those that are serious about golf. If you are constantly working on your swing, then you belong here. Also, if you are coming to Fiji to golf rather than adding a round to your pre-existing getaway. The newly built Intercontinental Fiji Golf Resort & Spa is located on the coast in the south west of the main island. Adjacent is the championship level 18-hole Natadola Golf Course. The views are gorgeous over the Pacific Ocean, as is the golf clubhouse which is where I spent my time given the challenging sloping course. The Sheraton Fiji Resort is one of seven luxurious establishments fringing the private and upmarket Denarau Island. You could stay at any of the other 6 fine hotels/resorts on the 'island', however Sheraton is the one that owns the 18-hole Denarau Golf Course. All are walking distance to the golf course, as it's centred on the island. At the other end of the Coral Coast from the Intercontinental, is The Pearl South Pacfic hotel. 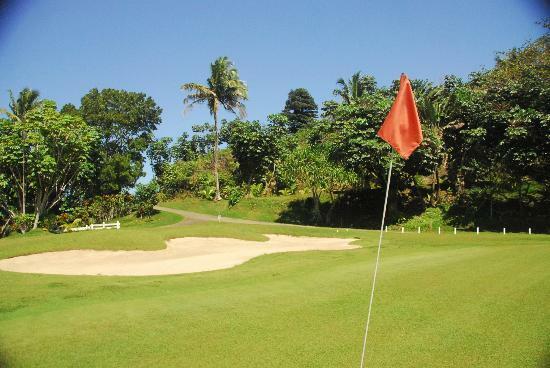 If you are around Suva, then it's Pearl Championship Fiji Golf Course with it's par 72 18-hole layout would be the pick. These are the better resorts if you want to play some rounds whilst on your relaxing getaway. The international renown hotel chain has it's Shangri La Fiji Resort & Spa on it's own island, albeit connected to the mainland via a causeway. You could stay in a room overlooking the ocean at the front and overlooking it's 9-hole golf course at the back, whilst being walking distance to everything. And the island has just about everything you'd want in a holiday. If you want to play golf and have little one's, this is probably the pick. Plantation Island Resort is great for kids, so while they are having all sorts of fun with it's free 'Coconut Club' (kids club), you can take a leisurely stroll and hit through a round of 9 holes. For the couple who like activities. 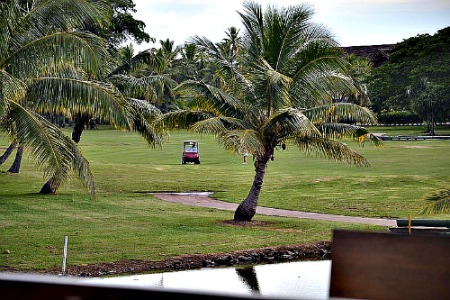 If you want to get things rolling on your honeymoon and need an activity to get things going in the right direction, then golfing at the luxurious couples Namale Fiji Resort is a goer. If you think she's not up for the 9-hole 'real' golf course experience, then it's virtual golf option is sure to be a winner. Be sure to help her with her swing. If you are rich and famous, (or just rich) and want to getaway with absolute privacy, this can't be beaten. It couldn't get any more exotically exclusive than this. Laucala Resort on it's own private 12 km² island has 25 uber-private uber-luxurious bures on the whole island including it's stunning 18-hole golf course. No visitors as the island is only open to it's handful of guests. Similar to Laucala in that luxurious and exclusive Wakaya Club Fiji is on it's own private island, a playground for the rich, and has it's own 9-hole golf course.